The ASRock Professional series drop the gaming-themed stylings the gaming range, with both the B450 Pro4 and B450M Pro4 featuring a subtler black PCB, with a grey contrasting pattern printed on. The Pro4 models are aimed at professional users looking for a solid foundation to build a system without sacrificing quality, but without encumbering budget away on unnecessary componentry and features. While the primary difference between the B450 Pro4 and B450M Pro4 is form factor, the larger and ATX sized Pro4 model has a full-length PCIe 3.0 x16 slot, a secondary full-length PCIe 2.0 x4 slot and a total of four PCIe 2.0 x1 slots. 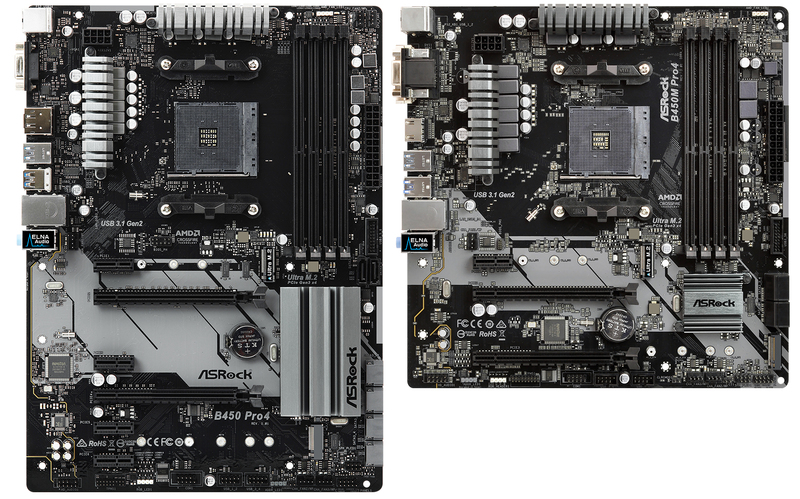 The smaller B450M Pro4 is of the microATX standard, but also features two full-length slots with the top slot operating at PCIe 3.0 x16 and the bottom one running at PCIe 2.0 x4; a single PCIe 2.0 x1 slot is also present. The similarities don’t just stretch to design, but they look to share identical power deliveries with a 9-phase offering running in a 6+3 configuration; even the power delivery heatsinks are identical, with the chipset heatsink on the B450M Pro4 model being smaller due to size constraints. Both B450/B450M Pro4 motherboards have a total of four DRAM slots with a supported capacity of up to 64 GB of system memory. Support for up to DDR4-3200 is featured with both models offering support for ECC and non-ECC unbuffered DDR4 memory. Storage wise, the ATX sized B450 Pro4 has a total of six SATA 6 Gbps ports offering support for RAID 0, 1 and 10 arrays; the smaller microATX B450M Pro4 has a total of four SATA 6 Gbps. The Pro4 pairing also feature two M.2 slots each with the best slot operating at PCIe 3.0 x4, while the second M.2 slot on the ATX B450 Pro4 has support for both SATA and PCIe 3.0 x2 drives. Due to space constraints on the microATX B450M Pro4, the second M.2 slot is located on the rear of the PCB and only supports SATA 6 Gbps SSDs; this slot shares bandwidth with the SATA port number 3 meaning only one can be used at any one time. On the rear panels. 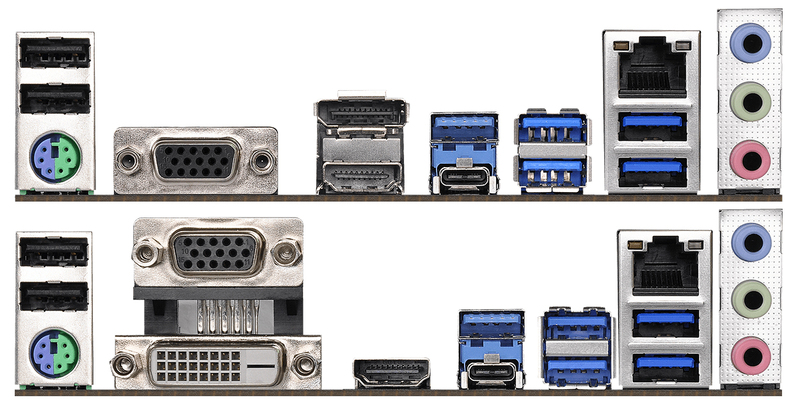 Both the B450 Pro4 and B450M Pro4 share near identical connections with the biggest difference being that the B450 Pro4 has a DisplayPort 1.2 video output, while the B450M Pro4 has a DVI-D instead. Both models feature a single HDMI port and a legacy D-sub output. On the rear panel for both are a single USB 3.1 10 Gbps Type-A port, a single USB 3.1 10 Gbps Type-C port, four USB 3.1 5 Gbps Type-A ports, two USB 2.0 ports, a PS/2 combo port, a single LAN port powered by a Realtek RTL8111H Gigabit controller and three 3.5mm audio jacks which are controlled by a Realtek ALC892 audio codec. Both B450 and the B450M Pro4 are designed for professional and regular system users, although gaming on either model wouldn’t have any detrimental effect on performance other than the lack of RGB lighting which seems to be the most popular feature on gaming branded boards. The B450 Pro4 is set to retail for around $89.99, with the microATX sized B450M Pro4 coming in at a slightly cheaper $79.99.